Total spending on drugs in Canada increased by 11% last year to $24.8 billion (see Fig. 1), according to the Canadian Institute for Health Information's annual drug expenditures report. Drug spending consumed 17.5% of the health care dollar in 2005, up from the 9.5% share it claimed in 1985 when drug outlays tallied $3.8 billion. CIHI surmised the explosive growth in drug spending was attributable to a wide range of factors, including: higher prices for both brand-name and generic drugs, particularly new products, which are typically introduced to the market at very high levels; aggressive marketing of drugs to physicians and direct-to-consumer advertising by industry; changes in prescription and dispensing practices; inflation; the advent of new drug therapies for once untreatable or under-treated diseases, or for disorders once treated by surgery; and demographic changes, ranging from growth and aging of the population to epidemics or emerging new diseases. 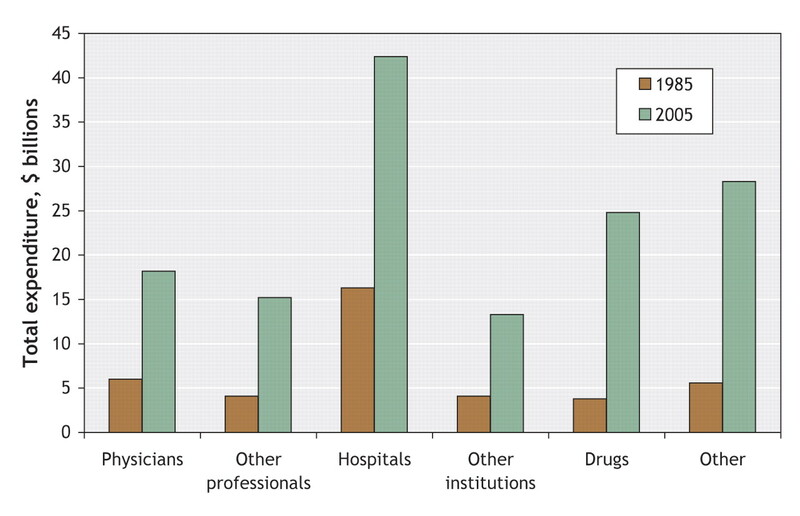 With drugs commandeering an ever larger slice of health spending, the system continues to spend a smaller share of its health care dollar on physicians and hospitals. Spending on physicians rose to $18.2 billion in 2005 from $6 billion in 1985 but dropped from 15.2% of total spending to 12.8%. Hospital spending dropped to 29.9% from 40.8%.